The Works of Antoni Gaudí represent the creative architectural works of this Modernist architect from the late 19th and early 20th centuries. Gaudí was born in 1852, and died 74 years later in Barcelona. From the 1880s he did a lot of work for the Güell family, who supported him with money and gave him freedom in his work. Gaudi's monuments in Barcelona are easy to visit. 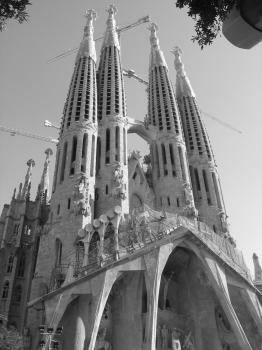 On our trip in 2006, we started at the Sagrada Familia. I had been there before (15 years ago), and my impression is that the construction works have taken on some speed. I have memories of an empty church, but now both the exterior and interior have a lot of new features. It even has a roof nowadays. The tourist masses hadn't changed though: this must be the most visited sight in Barcelona (together with Nou Camp, Barcelona FC's football stadium). Second stop: the formidable Park Güell. Near the entrance it was also very busy, but further into the public park you can pleasantly sit or walk around. Just to sit on those quirky benches! We also liked the plants (cactusses, yes I know, but we don't see those daily in the Netherlands). And finally, new to me, Casa Battló. This is one of the fine modernist houses at the Passeig de Gracia, in the heart of Barcelona. A visit to its interior is rather costly (at 16 EUR), but it's definitely worth it. With an audioguide you can tour about 16 rooms, all up to the top of the building. The house reminded me of the Town Houses of Victor Horta in Brussels, however larger and more over-the-top. 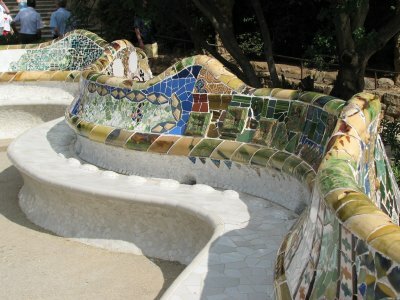 I have made multiple visits to the five accessible Gaudí properties in Barcelona over the course of the last 15 years. They are all worth visiting. My personal ranking order is Sagrada Familia, Parque Güell, Casa Mila, Casa Batlló, Palacio Güell. Only the Nativity façade and the crypt of Sagrada Familia are part of the WH designation, being the only components of the church largely completed during Gaudí's lifetime. You can actually admire the façade from the sidewalk of Carrer de la Marina. But the church is so unique and incomparable both in its exterior and its interior that no visit to Barcelona can be considered complete without stepping inside for an extended look. Parque Güell dazzles with features such as the Hypostyle Room (aka "Hall of 100 columns" - there are only 86 of them, in fact) and the main terrace with mosaic-decorated benches above it. If you come here early in the morning, it is a prime spot for catching the sunrise over the city. Casa Mila is a remarkable example of ingenuity in civic architecture, with no two walls anywhere in the building meeting at a straight angle. Its roof, with dozens of chimneys shaped as fantastic sentinels, is delightful and even otherworldly. Casa Batlló is also brilliant but I would rate its interior a notch lower than that of Casa Mila. The fish-scales exterior may be its most striking feature. Finally, Palacio Güell, the earlier of Gaudí's major works is decidedly less exuberant than the other buildings on the list. The interior, nonetheless, offers some impressive features, and the roof is a vibrant predecessor of the more expansive roof of Casa Mila's. The sixth property in Barcelona, Casa Vicens, has opened its doors to the visitors for the first time in history in November 2017. 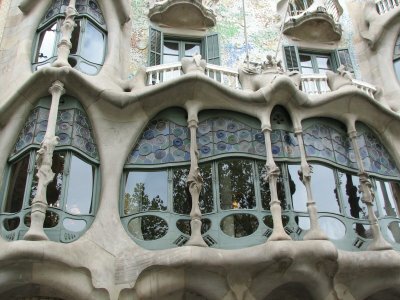 I stopped by to admire its exterior in the past, and it will now be a prime target for visit on my next Barcelona stay. The final location of this serial site is the crypt in Colonia Güell, 25 minutes by car from the city center, which I have not been able to work into my plans on any visit to Barcelona. Starting at sunrise in Parque Güell, it might be possible to visit five of Gaudí locations in Barcelona in a single day, but it will require uncommon effort at planning and you may end up feeling rushed if you attempted that. All six of them in one day are possible only if you do not go inside one or two. Each of the properties requires close to two hours in order to fully appreciate. Advance online ticket purchase (for a specific time-slot) is highly recommended for all locations except the park, and is absolutely essential for getting into Sagrada Familia. I went to Barcelona for the Gaudí sites twice, in November 2014 and March 2015. On our first visit we took the train in from Girona, and on the second flew to El Prat airport and stayed in the city itself. We managed to visit every site but the Crypt at Colonia Güell. Our first site on trip 1 was Casa Battló, which is the most expensive to visit, at €21.50. Wealthy textile manufacturer Josep Battló i Casanovas was fed up of his grand house being known as one of the most boring apartment blocks in the district, so he called Gaudí. The building is known for its avoidance of straight lines, and walking through its rooms makes you feel a little queasy. We next visited Palau Güell, built for Gaudí’s most famous patron, Eusebi Güell - an industrialist and an extremely wealthy man. According to the in-house audio guide, he has been ranked by Forbes as among the top 20 richest people who ever lived, with a fortune of €75bn in today’s money. The building was Gaudí’s first major project, and is more restrained than his later works. Nevertheless, it has a wonderful roof covered in colourful chimneys. Next up was La Sagrada Familia, which is a sight to behold. The sheer cavernous enormity of the space is something I have never experienced before. More so than most churches, the interior is full of colour. Our final stop on trip 1 was Park Güell and its famous views over the city of Barcelona. Returning several months later we went straight from the airport to the Casa Mila (which had been covered in scaffolding on our previous visit but was now uncovered once more). It is 50 cents cheaper than the Casa Battló, at €21. Casa Mila – also known as La Pedrera – is topped with ornate chimneys, conveying the architect’s philosophy that functional items should be made decorative too. We then had just enough daylight left (on the last day before the clocks changed) to see the Casa Vicens. This is a fully private residence, so you have to settle with viewing it from outside in the street. It was one of Gaudí’s earliest buildings in Barcelona – a project that helped him to make a name for himself in the Modernisme movement. The house clearly shows the influence of Moorish architecture, a collective memory that has affected Spain in a way that could hardly be imagined in other European countries. I was 21 years old walking around Barcelona with 2 friends. Would you believe it, without planning and with little knowledge about Spain, I stumble across the Sagrada Família! I was stunned, what was this? This is NOT like the other churches in Europe? I've never forgot this scene. This magnificent structure stopped me in my tracks in pure awe. My curiosity was awakened. During my visit to Barcelona, I learned about Gaudi for the first time. I can't help but enjoy the naïve experience of the 21 year old version of myself. In hindsight some regrets. I was essentially broke in Barcelona. A very weak dollar compared to the Euro made my almost non-existent savings even more depressing. This made my visit very selective, indeed a 15 Euro entry ticket (about $30 US Dollars at the time) felt like highway robbery for a student in my situation. Another challenge, my age and experience, I knew nothing of UNESCO and my travel plans (while ambitious) would be very different in hindsight. While I count this encounter as a visit to a worthwhile WHS, mostly because I was stunned by the structure in front of me. It is at best, a brief experience of this unique world heritage site. 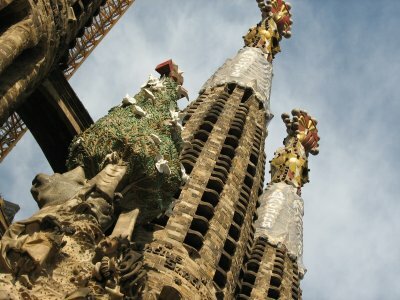 I look forward to the day, hopefully not too far away, when I can truly explore Gaudi's masterworks in Barcelona. The works of Antoni Gaudí are among the most visited sights in Barcelona and it is hardly possible to resist the fascination of these buildings, even if you are not a fan of modern architecture. On our trip to Barcelona in May 2014 we managed to visit all seven inscribed sites. The entire façade of the Casa Milà is currently under scaffolding (according to the information at the ticket counter until early 2015), but this does not affect the visit of the interior. The highlight is the rooftop, a garden of spectacularly designed chimneys, ventilation shafts and staircase exits grouped around the two courtyards. In the attic is an interesting exhibition which explains Gaudí's architectural principles by means of models of his most important works. Finally, you can visit an apartment with furniture from the early 20th century, but it is not very interesting and has no connection with Gaudí. Casa Batlló probably provides the most comprehensive impression of Gaudí's ideas. He redesigned an existing building in the style of Modernisme, including the interior, such as lighting, windows, doors, stair railings etc. I was most impressed by the central light well, which is completely covered with blue ceramic tiles. The colour of the tiles is darker at the top floor, and if you look from the ground floor upwards, you have the impression of a uniform blue colour. With an audioguide you can visit the former apartment of the Batlló family, the central staircase, the attic (also a highlight for architecture fans), and the roof terrace. The colourful façade is a symbolic illustration of the legend of Saint George and the dragon. And the building is beautifully illuminated at night. 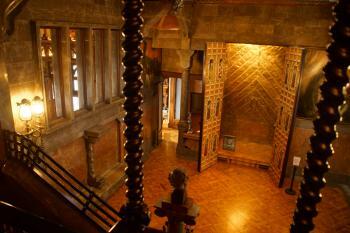 The Palau Güell was reopened for the public in 2011 after years of restoration. It was one of the first works of Gaudí, but his style and his attention to detail are already apparent. The visit was a real surprise. Most striking is the elaborate design of the ceilings, stairs and railings. There is lavish decoration, lots of precious wood with inlays. The living rooms are grouped around a central hall (photo) with a parabolic dome. You can visit the entire building, from the vestibule in the ground floor up to the roof terrace (again with the typical chimneys and ventilation shafts). The Park Güell north of the city centre is another highlight. You have to pay an entrance fee for the so-called monumental zone which comprises the well-known parts of the park: the entrance pavilions, the columned hall (Sala Hipóstila), and the terrace with benches, which are decorated with mosaics from ceramic shards. From the terrace you can enjoy spectacular views over Barcelona. But it is also worthwhile to explore the outer areas of the park with several bridges and colonnades made from unhewn stone. These parts are freely accessible and also within the core zone of the WHS. The Casa Vicens is not open to the public (a museum is planned for 2016), but the façade is worth seeing. It was obviously inspired by the Mudéjar style and is very different from other Gaudí buildings. A detour to Casa Vicens can easily be combined with a visit of Park Guell, it is just a walk of 20 minutes from the main entrance of the park. The Sagrada Familia is a must-see for most Barcelona tourists, absolutely understandable, the interior of this unique basilica is overwhelming. But only the Nativity façade and the Crypt are parts of the WHS. Both can be visited free of charge. The sculptures of the façade can be seen from outside the barrier (best with a pair of binoculars or a telephoto lens) and the Crypt is freely accessible. But the opening times differ from those of the Basilica, on our visit from 9 to 10 am and 6 to 9 pm. Finally, the Crypt of the Colonia Güell: at first glance it is less impressive than other Gaudi buildings, but the inscription is absolutely justified. In this unfinished building, Gaudí has realized for the first time several typical structural elements and innovative techniques. It is worthwhile to explore the entire Colònia Güell, the visitor centre offers an audioguide. It was a nice half day trip (20 min by FGC from Plaza España) and a pleasant escape from the crowded city centre. It is quite costly to visit all six sites, we paid about 80 Euro per person. Thus, visitors who are not enthusiasts of modern architecture will probably visit one or two sites and view the others from the outside only. Not easy to give a recommendation, but I would suggest to visit at least Casa Batlló and the Park Güell. Despite the steep entrance fees there are long queues at most of the sites. Thus it is best to visit either early in the morning or in the evening. Or to buy tickets online (possible for all five sites in Barcelona), but you have to book a fixed time slot (except for Casa Batlló). We bought tickets online for the Sagrada Familia, Casa Mila, and Casa Batlló. All in all, one of my favourites WHS among those I've visited so far. I visited this WHS in November 2007. Gaudí's masterpieces can be seen all throughout Barcelona. The city's landmark is obviously the Sagrada Familia, closely followed by Park Güell. However, the highlight of my trip was entering the Casa Batilló. It was like stepping into a cartoon or into another world. I agree with David's comments about the crypt at Colonia Guell. However it can be reached by FGC train S8 from Plaza Espanya to Colonia Guell station, from where you follow the blue footprints to the site. Also, I would recommend Klaus visit the interior and the rooftop of Palacio Guell at his next opportunity. They are outstanding. That Gaudi is the most original modern architect is perhaps consensual. I truly loved what I saw (the usual Battlo, Milles, Park Guell and the Sagrada Familia). I had a lovely experience walking to the Pedralbes Convent (very nice to visit!) when on my way I passed a mansion which reminded me of Gaudi. 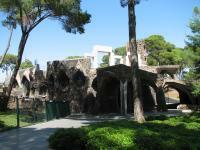 It later turned out to be Guell Palace which was one of Gaudi's earlier works. Despite being typical and original in its language was more clearly related to the Wiener Secession movement. This palace too had its own twist in the columns, gilded gates and arches. It was nice to see one of Gaudi's less familiar works without so many tourists around. Afterwards I found out this palace was once a temporary royal residence and that it now houses a ceramic museum. I'm now looking forward to my next visit to Barcelona to see the interior of this house as well. Absolutely beautiful!!!!!!!!!!! Absolutely amazing. His work at Casa Mila and at Guell Park were a true work of art. Ah, beautiful Barcelona! I have fond memories of my visit to the Catalan city and whenever I think of Barcelona I think of the buildings designed by Antoni Gaudí. My favorite building was the Casa Mila with the magnificant roof where you can walk around for a long time. A stroll or a relaxing afternoon in Parque Güell is definitely worth your time, there are different areas in the park to discover and you have a nice view over the city. Casa Batlló has an interesting façade, but the inside is also worth a visit. Casa Vicens looks a bit different than the other Casas, and unfortunately the inside is not open to visitors, but you can spent some time just looking at all the details of the outside alone. 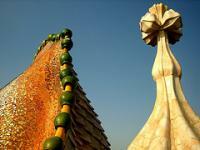 For most people coming to Barcelona, seeing the numerous Gaudí sites is one of the main reasons for their trip. It´s definitely an acquired taste, and I can´t say I had previously been very interested in modern architecture, but these sites were really interesting and, yes, beautiful. The sites are spread all across Barcelona, but can be seen in a day if you take the subway. The Parc Güell is the largest, and in my opinion, the best of them. 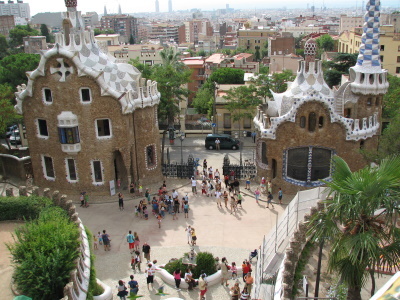 A public park on the north side of the city, it features many buildings, figures, statues, and other structures of the whimsical kind that Gaudí is famous for. The most famous building by this crazy genius is definitely the Sagrada Familia, officially called a temple, but really a church - one that will be finished in just a few decades... Apparently not the whole building is of WH value, but only the Nativity facade and the Crypt, which seems to be a bit small-minded by UNESCO...I found it unnecessary to brave the very long lines and to pay the entrance fee, since the good things about this building can really be seen from the outside. The site also comprises a collection of single buildings across central Barcelona, including Casa Mila, Casa Vicens, Casa Batlló, and Palacio Güell (still being renovated). Again, I thought it was sufficient to admire the facades and not see the inside (especially considering Casa Mila´s long lines and steep fees). Definitely worth the 20-minute trip to the suburb of Santa Coloma de Cervelló is the Crypt of Colonia Güell, really a fascinating building and a recent addition to the WH site. So when you´re in Barcelona, either you´ve gone there to see the Gaudí sites, or you will see them anyway, because there´s really no escaping this man´s legacy there (is there any man who has done more for a city´s tourism industry than Gaudí has for Barcelona? Well, maybe Mozart and Salzburg). The works of Gaudi are fascinating and are an excellent feature of the wonderful city of Barcelona. I'm not a massive Modernista fan myself, but I can recognise that these buildings are very important indeed. Eh, it`s not my cup of tea but still a nice outing to go see these most whimsical buildings and gardens. Very colorful and modern. Watch out for rabid animals, gypsies, and "Living Statues" who will accuse you of taking their picture and demanding a good deal of money for the privaledge...even if the accusation is false. I've lived in Barcelona for one year and I'm used to go there at least one time per year. I've visited all Gaudi's masterpieces (Parque Güell, Palacio Güell and Casa Milá) and also the Casa Batlló that opened for visits very recently. Further, I've been in other houses due to Gaudi in Barcelona (looked only the exterior) and also in the Palacio Episcopal in Leon (Castilla-Leon, Spain). In a single word: spectacular! I too have admired Gaudi's querky designs. But spare a thought for the poor builders. Gaudi's designs are a nightmare to construct. It is the reason why the Sagrada Familia church has been under construction for 125 years already, and still has some way to go. In our travel around Spain we have been to Santa Coloma de Cervelló to visit one of the seven works of Antoni Gaudí i Cornet included in this WHS, the crypt of the Colònia Güell. It was commissioned to Gaudí in 1898 and he reflected for ten years on the project before beginning the building in 1908; only the crypt was built when the work was interrupted in 1914. We have seen only this Gaudí’s work because we haven’t been in Barcelona this time because it takes to much time to visit it for combining it with the tour of almost all Spain. We decided also to visit the church apart from the travel, programmed for the future, to Barcelona, because it is hard to reach it from the city by public transports, even if it isn’t far away. We arrived to the Colònia Güell (from the motorway A2) when the church was closed, because its opening time is from 10 to 14 and from 15 to 19 (on Saturday and Sunday from 10 to 15. So we visited before it the village (about which you can find information on the web site http://www.santacolomadecervello.org/municipi/colonia/colonia.htm), where a community working in textile industry lived. I think that the whole industrial village, even if it isn’t even on the Spanish Tentative List, can be inscribed on the WHL separately from the WHS of Gaudí’s works (in which is inscribed only the church being the only one Gaudí’s building in the village). It is an outstanding example of industrial archaeology and probably the best application of Catalan modernism in an industrial context, with beautiful works of important architects like Francesc Berenguer i Mestres and Joan Rubió i Bellver. The main features of the village, that depended directly from the huge factory, also built in modernist style, are the l’Ordal House, the l’Espinal House, the school with the teacher’s house, the parish house and the cooperative. The industrial village reminds me the similar Italian WHS of Crespi d’Adda; the application of an important modern style in an industrial complex can be seen also in the WHS of the cool mine Zollverein in Essen in Germany, where the functionalism style was used. Then we bought the ticket for the church in the Tourist Office and went to visit it. It is really the strangest architectural work I have ever seen. I was really overwhelmed by its irregular and seemingly chaotic forms. It can seem to be everything apart a church. It is build in brick and stone and outside is characterized by the beautiful and coloured oval stained glass windows, protected by a kind of iron grate and inserted in oval sharp niches decorated with mosaics made of ceramic fragments. There is also a porch with beautiful oblique columns and vaults also decorated with mosaics, of which that over the main portal is the nicest. The interior is also the strangest I have ever seen: a sort of Neo-Gothic structure, reinterpreted in the modernist style, with all features completely different from each other. 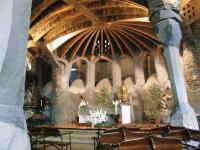 There are many different types of combined vaults and twisted columns. Also the furniture is modernist: altars, chairs, stoups… Today’s terrace on the roof of the crypt, which in the original project had to be the floor of the huge church, is also strange: there are three rectangular portals and a small bell tower of the church that had to be built. The church, completely authentic and perfectly conserved, is absolutely worthy to be visited and justifies its inscription as one of the most important outstanding architectural works of Gaudí, who, with its creative contribute and exceptional eclectic and personal style, revolutionised the architecture and the building techniques. However I think that, even if I haven’t visited them, also other Gaudí’s works could be included in this WHS, constituted of only seven buildings. In the photo there is the exterior of the crypt of the Colònia Güell. The works of Gaudi are possibly the biggest tourist attraction in Barcelona so these sites are very busy but still very impressive. Unfortunately Palacio Güell was closed when I was there, so I could only see the façade which is impressive but not as adventurous as the later buildings, but the iron gates are very nice. Also it is very close to the La Rambla so very central, and provides a good starting point if you want to then head north to see the other building’s in Barcelona’s two UNESCO sites. 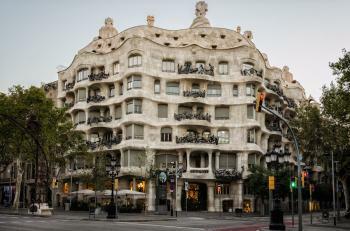 La Pedresa (Casa Mila) is on Passig de Gracia which is a hive of modernist architecture including Gaudi’s Casa Batillio which recently been added to the UNESCO site and to my eye it has the most impressive façade. La Pedresa is very popular so there are long queue to get in but the roof sculptures are brilliant the vaulted attic holds some interesting exhibits, the apartment however is a little dull and nothing out of the ordinary really. (Maybe not such a useful point but this was the UNESCO site with the most attractive and helpful staff I have ever visited!). The massive Sagrada Famillia is perhaps Barcelona’s most famous site, and I guess the most visited building site in the world (although maybe New York has a claim to this now as well). It is massive in scale and the amount of time it has/will take to complete. The crypt and the museum have some interesting parts, the models of the structure and apparatus used to plan it, including the string frame with little sand bags hanging upside down I found especially interesting. Also the tomb of Gaudi himself is here. The nativity façade is also impressive with the exception of the statues which just look out of place as if they were just cast and thrown on there. Parque Güell again is a very popular attraction so you will not have it to yourself unless you are an early riser! But the place is still very nice the two buildings at the entrance show Gaudi at his most playful so does the famous lizard on the stairs! And the tiled weaving bench is perhaps the most comfortable seat I have had the pleasure to sit on! Defiantly as good as I had hoped. 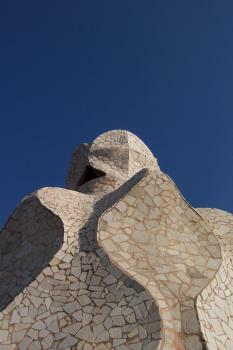 I was happy to see the site extended in 2005 to include some of Gaudi’s other works which add to the site overall. From "Parque Guell, Palacio Guell and Casa Mila, in Barcelona" to "Works of Antoni Gaudí"
Hypostyle: Parc Guell "The great entrance stairway leads to the Hypostyle Room, which was designed to be the market for the estate. It is made up of 84 striated columns inspired in the Doric order" . The Columns support the "Nature Square" directly above. 617 Community Members have visited.